In this week’s showcase, we are featuring one site that was actually a winner of a custom header design and another that invested in their own Custom CMS website. We felt that both of these websites were great examples of the possibilities that the NE1 website builder and our Custom CMS products can offer. Faith Bible Church, located in Libby, Montana, is a “Christ-centered, Bible-teaching church whose mission is exalting Jesus Christ, evangelizing and discipling people in service for Him, and connecting with each other.” They were fortunate enough to be a winner in one of our contests called the “Extreme Makeover OCC Edition.” As the winner of this contest, they received a Custom Header for the template of their choice. They chose to go with a Flash header with rotating images and animated text. 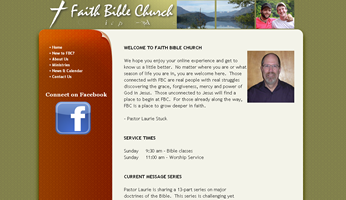 You can visit their site at http://www.libbyfbc.org/. Heritage United Methodist Church is located in Clearwater, Florida. They are a multi-generational community of believers in the United Methodist tradition growing together under the leadership of Jesus Christ. Their primary focus and audience is young families and children. Because of this, they chose to have an “edgier” website design. 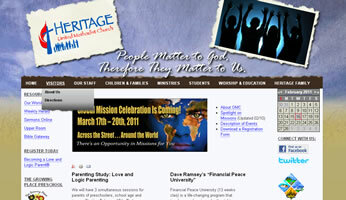 They also chose to have a second, yet similar design for the Student Ministry section of their website. Two of the favorite features on their website are their “Sermons Online” section, where visitors can stream audio recordings of past sermons from the website, and the event registration software, which allows the church to collect both information and money directly from the website for upcoming events. These are just a couple of the features that keeps their website remarkable and saves them time in the end.